Pradhan Mantri Jan Arogya Yojana provides a coverage of Rs 5 lakh per family annually and benefits over 10 crore poor families. 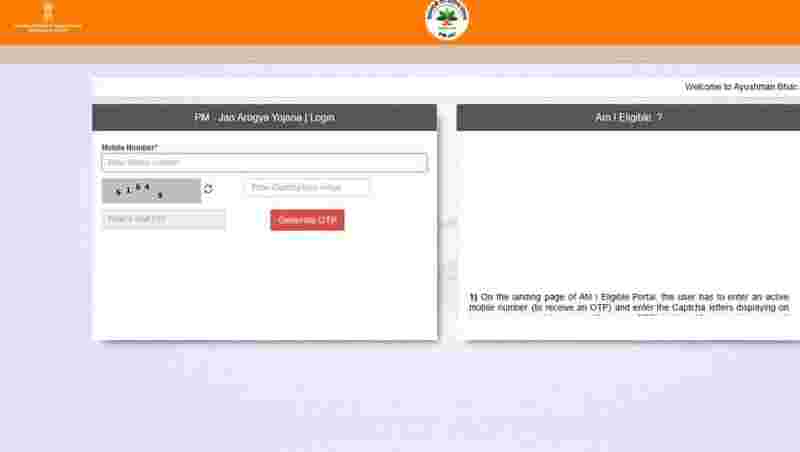 Have you ever registered for Pradhan Mantri Jan Arogya Yojana online? Was the website official or fake? In the wake of several fake websites promising registration for Ayushman Bharat-- National Health Protection Mission (AB-NHPM), the parent body for implementing the scheme, the National Health Agency (NHA), has launched a website and a helpline number to help prospective beneficiaries check if their name is there in the final list. PMJAY provides a coverage of Rs 5 lakh per family annually and benefits over 10 crore poor families. The scheme will be rolled out from Jharkhand on September 23. 2. On the landing page of AM I Eligible Portal, the user has to enter an active mobile number (to receive an OTP) and enter the Captcha letters displaying on the screen and click on the “Generate OTP” button. After this, the user will receive an OTP as a text message on the mobile number entered. The user has to enter this OTP and click on “Verify OTP” which directs to a page to enter the details for search. 3. An individual can search whether he/she is an eligible beneficiary for Pradhan Mantri Jan Arogya Yojna (PMJAY) using a) Mobile number/Ration Card Number (collected during ADCD drive), b) SECC Name or c) RSBY URN. 4. If the search is successful, the individual has an option to receive a text message with the HHID number/RSBY URN for future purposes on his/her phone by clicking the “Get SMS” button and entering the mobile number. Note: This mobile number can be different from the mobile number used in the first step for OTP Generation. The scheme will target poor, deprived rural families and identified occupational category of urban workers families - 8.03 crore in rural and 2.33 crore in urban areas - as per the latest SECC data, and will cover around 50 crore people.